God’s ancient way of dealing with sin and rebellion is a model toward understanding the final period of redemptive history. He warns of impending justice against wickedness. Then, in mercy, a time to repent is given. Often He discloses how long that probation will be! Noah: “his day shall be an hundred and twenty years” (Genesis 6:3). Jonah’s warning to Nineveh: “yet forty days, and Nineveh shall be overthrown” (Jonah 3:4). The ten-day Feast of Trumpets (Leviticus 23:23-25) was Israel’s last chance to be ready for the removal of sin in God’s church at the Day of Atonement (Leviticus 23:27-32). The latter event sealed the destiny of every Israelite. The Hebrew feasts are a dossier of stunning eschatological alerts which show that preparing for eternal rewards is time limited. This is especially true of the fall Feasts of Trumpets, Atonement and Tabernacles, occurring in the seventh month of the Jewish sacred year – Tishri (September–October). Trumpets lasted ten days, beginning on Tishri 1, designated as a “shabbaton” – a “solemn day of rest” (similar to the Sabbath day – Exodus 16:23 and Day of Atonement – Leviticus 23:39). It was a “Day of Blowing” trumpets, the onset of Israel’s final warning that time to repent was now short. This period was Israel’s last opportunity to prepare to stand before God’s judgment on Atonement – a day of judicial decisions and sentencing. If they weren’t ready, they were lost (Leviticus 23:49). The Jewish feasts typified key parts of heaven’s redemptive plan. This “story” and many of its parts (given here in brevity) can be replicated through myriads of Biblical illustrations. Difficult to believe because of a “tarrying time,” easy to deny because of the intensity of life and difficult to sense because of our natures, that redemptive plan will soon have an end. We are soon to enter the final period of earth’s warning! – a fall Feast of Trumpets. A fall feasts template is found in Revelation! Its sequenced metaphors are stunning and incredibly valuable! Why are such details important? The Feast of Trumpets heralds that the Judgment of the Living is about to commence. Both are discussed in Revelation as warnings and waymarks for God’s people. In turn, they link in a welded bond to the unsealed prophecies of Daniel (Revelation 10 – “little book”)! No one will be able to cry “The hour of his judgment has come” until they know this has begun (Revelation’s phase)! In the fall of the year, this process will commence. Once started, rapid fulfillment of numerous prophecies will march forward. Which year? We don’t know – but evidence suggests that we are on the verge. Perhaps …..! John also begins that book by noting that its contents will be “what must soon take place” (1:1) (within the context of its prophecies) (corresponding to Daniel 2:28-29). Then he notes “for the time is at hand” (1:3). Consequently, Revelation is embedded in prophecy that surrounds the very end of time. When Jesus says, “Behold, I come quickly” (cf. 22:7, 20), it relates to the body of most messages within that book. The book is framed with the imminent eschaton in mind (22:10). In the first chapter, John goes into vision, heralding the onset of some very important timing issues (1:10). This is how that begins: “I was in the Spirit on the Lord’s day, and heard behind me a great voice, as of a trumpet” (Revelation 1:10). The Feast of Trumpets begin on a special Shabbaton. If this refers to that feast symbol, it should be embellished with additional associations to the two other fall feasts. That will be apparent shortly! Stunning – the imagery of Christ, that John now sees, is of a King, Priest and Judge. As judge, Christ’s role is to “see” and “warn.” That is depicted by his eyes as a “flame of fire” (1:14). Wonderful is the structure and context. The messages to the “seven churches” (1:11), those claiming to be His people, then follows. He is among those churches (candlesticks – 1:12) providing counsel. This is Feast of Trumpets time – discovery time – “last chance to change time”! The message to the seven churches is Christ’s last pastoral advice to them. It portrays God’s final time of mercy. “This is what I see.” “This is what I advise.” It is His last key “pastoral visit” to His people. Those churches are not numbered. They are only in a sequence of the postal route in the time of John. They represent a corporate whole with diverse needs. This is a Feast of Trumpets, “discovery time,” “repentance time.” This is being played out in its elevated meaning with these churches! Probation is soon to close. Like all good counselors and advisors, Jesus closes on a positive note – one of hope. A judgment – final decision time – should now be revealed. And It is! “Immediately I was in the spirit; and, behold, a throne was set in heaven, and one sat on the throne” (Revelation 4:2). “Setting” a throne and then observing the one who “sat” on the throne is judicial – judgment – Atonement language. God is described as “sitting on the throne” often in Revelation (e.g., 5:1, 7, 13; 6:16; 20:11; 21:5). This ties directly to Daniel’s vision of a similar “event,” where thrones were set up and the “Ancient of days did sit” (Daniel 7:9). The imagery reveals that the supreme potentate sits in final judgment upon the world. Now, in the context of the seven churches, the living saints were warned to prepare since they were faced with that final review. “For whatsoever soul it be that shall not be afflicted in that same day, he shall be cut off from among his people” (Leviticus 23:29). That group would perish without hope. The review of the books finalizes those seven groups who call themselves Christian. This is intriguing. Expositor White could see through this Atonement Day issue. The seven churches convey key divisions of resistance and loyalty toward truth within the Christian world at the end. That was/is necessary for Christians to be sensitive to their deficiencies and to nurture what needs maturing. They are highly personal messages. Each represents elevating counsel from the lips of Jesus Himself. But – He moves forward from another angle in apocalyptic prophecy. The book becomes administrative. John is given views of that judgment, God’s glory and key attendants around His throne, and insight into heavenly worship (Revelation 4). There he sees a dramatic saga of a seven-sealed scroll. This will clarify why the wicked were lost. It is a “book of death” (Revelation 5). Finally, the breaking of each seal “causes” a distinct end-time event to occur. The scroll can’t be reviewed until the last seal is broken. Our attention is directed to the first group of seals in a 4–2–1 division (Revelation 6). Revelation now introduces us to the four groups into which God finally divides that Christian world, leading into this judicial end. 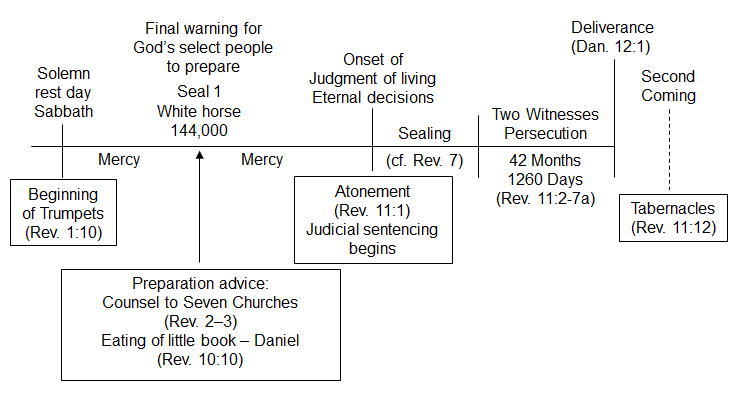 The following graph summarizes major issues in last-day prophecy. This all opens to our understanding early in Revelation. In the list of the twelve saved “tribes” in Revelation 7, Dan and Ephraim are missing. They are lost! Though the people of Judah (144,000) and Reuben (great multitude) will experience conflicts even to the level of martyrdom (fifth seal), the prophecy quickly turns to hope. 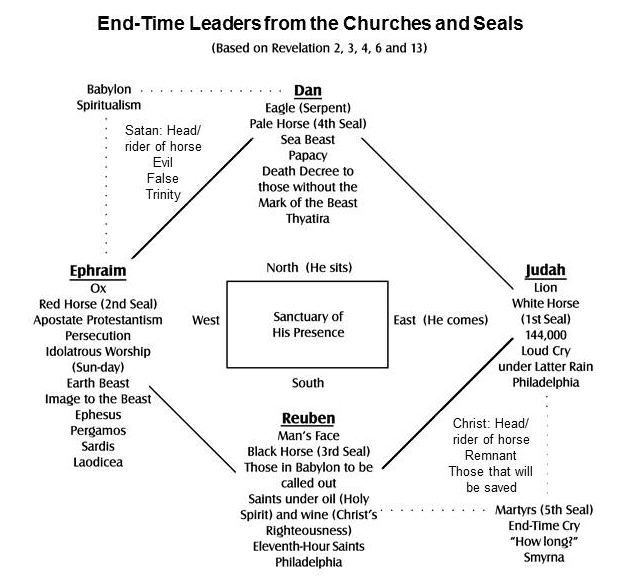 Sixth Seal – Jesus comes. Interlude – Revelation 7 – the judicial outcome of those who will be translated. They will be sealed for eternity. Seventh Seal – the silence of awe – when we are with Jesus for the first time. Then, in stunning review/overview, Jesus unfolds to John the good/evil conflict right at the end. Trumpets 1–4 God’s wrath begins to put a check on evil. Trumpets 5–6 Satan’s full expression of evil is permitted. Saints, however, are protected. During Trumpets 1–5, the intercessory work of Christ continues. When the seventh trumpet sounds – the cry rings throughout the universe. “And the seventh angel sounded; and there were great voices in heaven, saying, The kingdoms of this world are become the kingdoms of our Lord, and of his Christ; and he shall reign for ever and ever” (Revelation 11:15). As this solemn series of prophecies comes to its end, God provides another interlude – Revelation 10 and 11:1-13. Add to your knowledge base the unsealed portion of Daniel. Be aware that the judgment of the living, when your eternal destiny is sealed, is coming (it is before the Sunday laws – another study). Then be filled with the Spirit. Witness to all these things. We’re at the brief period when this prophecy of Revelation 11:1 is about to begin (many studies to show this)! Study – get ready. Fowler, Franklin S., Jr., M.D. ; Christ’s Introduction to Apocalyptic Prophecy (Matthew 24 and 25) (Christian Heritage Foundation, Lucerne Valley, CA, 2014). White, Ellen G.; The Great Controversy, pp. 399-400. Osborne, Grant R.; Revelation (Baker Book House; Grand Rapids, MI), p. 54; cf. Thomas, Robert L.; Revelation 1–7 – An Exegetical Commentary, vol. I (Moody Press, Chicago – 1992). Osborne, op. cit., p. 238. Osborne, op. cit., p. 226 (cf. Aune, David E.; Journal of Biblical Research, 28:5-26, “The Influence of Roman Imperial Court Ceremonial on the Apocalypse of John,” 1983). White, Ellen G.; The Great Controversy, p. 480. Fowler, Franklin S., Jr., M.D. ; The Seven Seals of Revelation (Christian Heritage Foundation, Lucerne Valley, CA; 2004–present).